"Phillip (IV), King of France to his lieges at the Roman Court. Commands them to request the Pope's favour for his beloved William le Wallace of Scotland, Knight, in the matters which he wishes to forward with His Holiness, Monday after All Saints, Pierrefonds". There is only one item that we know of that still exists that we can connect directly to William Wallace. Although the Wallace Sword is on display at the National Wallace Monument near Stirling in Scotland, we know that some changes have been made to it over the centuries. For example, a new pommel was added in the time of King James IV (1488-1513) So there is always going to be some debate over how much of it is original, although I believe that it is at least the “ghost” of the sword of our national hero. 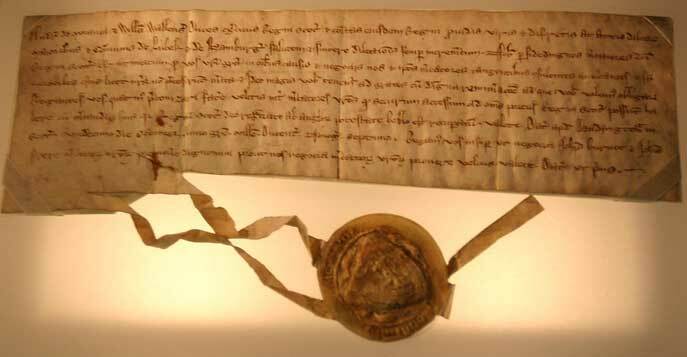 There is the famous “Lubeck Letter” which bears the seal of Wallace, that was sent to the German town of that name after the victory at Stirling Bridge in 1297, stating that Scotland had been cleansed of the invader and was again ready to trade with the ports of the Hanseatic League. During the Second World War Lubeck was bombed, and its archives moved to a saltmine for safekeeping. After the war, documents were taken east by the Russian army. They were later returned to Germany, but the medieval documents - including the Lubeck letter - were missing, presumed lost. Amazingly, in the 1970s, Lubeck's medieval manuscripts turned up in a Soviet archive and in 1990 were returned to their home city. This letter has been on show at the Scottish Parliament building. Although this letter bears Wallace’s seal, it was probably written by a scribe, and although it is possible that Wallace sealed it himself, we have no way of knowing this. Plus, the letter was sent to Lubeck so officially it is the property of Lubeck itself. When Wallace was captured he had several documents on his person that were taken south to his trial. These are recorded as being letters between Wallace and magnates of the Scottish realm, a letter from the King of Norway, and a letter given to Wallace by the King of France in 1300. All but one of these have disappeared or been purloined over the centuries- a great loss, as we could have learned so much from them. The letter from the King of Norway was still on record in the 1830s, but has disappeared since that time. The letter from the King of France still exists and is kept behind closed doors at the Records Office in Kew in England (as are many other Scottish related documents- but that is another story!) This document was taken from Scotland, and it was a document that belonged to a Scot, so it should rightfully be on display in Scotland where the public can look upon the only known personal possession of Scotland’s national hero, Sir William Wallace. I want to see this letter on show in, say, the Museum of Scotland, where ordinary Scots can take their children and show them something that Wallace himself once looked upon in his own hand. The one article we know was a personal possession, and we can look upon it as he did. It was given to him in November 1300, and it was on his person when he was captured in August 1305, so he carried it for almost 5 years. Wallace visited the King of France trying to elicit help for little Scotland, whose very existence was under threat from the deprivations of the English king. Wallace also wanted to visit the Pope, then the most powerful man in Christendom, to see if he would bring pressure to bear on Longshanks. The King of France gave Wallace a letter of introduction to his agents at the Vatican, to see if an audience could be granted. It is only a little thing, just a small rectangle with a few lines written upon it in Norman French. “Phillip (IV), King of France to his lieges at the Roman Court. Commands them to request the Pope’s favour for his beloved William le Wallace of Scotland, Knight, in the matters which he wishes to forward with His Holiness, Monday after All Saints, Pierrefonds”. You can see Wallace’s name in the middle line, just on the crease. In Norman French, he is of course, called Guillaume. This letter must be brought back to Scotland. It is important to the Scottish people. I have already managed to get the story published in 6 Scottish newspapers, and this publicity caused it to be a matter raised in parliament by Jim Mathers MSP. It has been mentioned on the BBC News too. You can help if you wish, by writing to an MSP, saying that you back this move to restore to Scotland the only surviving Wallace possession. As a patriot, I would appreciate any patriotic help out there!